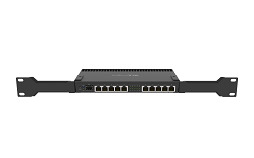 RB4011 series - amazingly powerful routers with ten Gigabit ports, SFP+ 10Gbps interface and IPsec hardware acceleration for a great price! The RB4011 uses a quad core Cortex A15 CPU, same as in our carrier grade RB1100AHx4 unit. The unit is equipped with 1GB of RAM, can provide PoE output on port #10 and comes with a compact and professional looking solid metal enclosure in matte black. RB4011iGS+RM (Ethernet model) includes two rackmount ears that will securely fasten the unit in a standard 1U rack space. Note: The RB4011 does not support Passive DAC modules, 1GB copper SFP modules and SFP GPON modules.